Guided fishing packages starting at $450 per day for two people. Fish for the week or just one afternoon. Pike Haven is located in a prime area for Salmon, Walleye, Northern Pike and Small Mouth Bass. In our area we have the sharp drop offs, the underwater shelves, the winding contours, the sand flats, and the rocky outcrops that hold the fish. Pike Haven Resort is located close to areas that consistently produce fish all year long. Areas such as the mouth of the Cheyenne River including Brush, Joes and Rousseau bays are very productive. On the main reservoir, Fantasy Island, Charlie, Mission, Agency and Mail Shack creek bays are nearby and always popular. 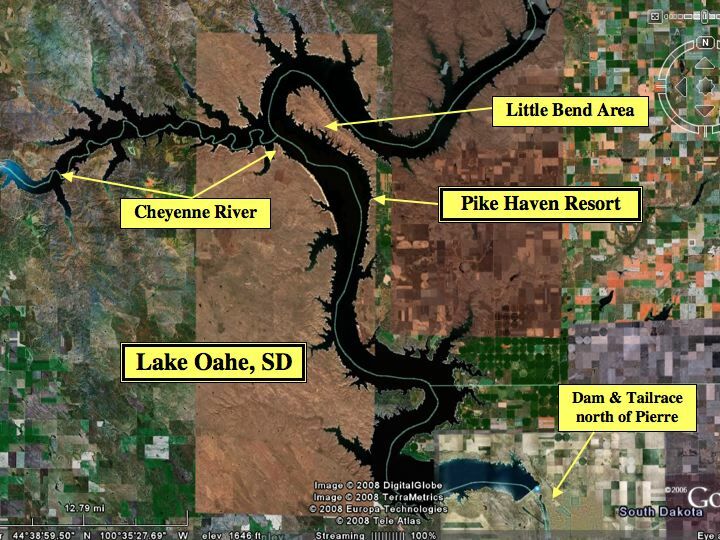 Within 6 miles of our ramp you can fish Fantasy Island, the sand flats between Agency and the Cheyenne River, the deep channel on the east side of Lake Oahe between Little Bend and Mail Shack. These areas produce trophy fish year after year. Our concrete boat ramp is open to the public and currently drops off into over 20 feet of water. And once on the water, Lake Oahe has plenty of depth, over 100 feet in the channel out in front of Pike Haven.